When you look at the description for Nanny McPhee Returns — Nanny McPhee helps a harried mother using magic to teach the woman’s children and their two spoiled cousins five new lessons — you might think it sounds just like the first movie. But don’t jump to any conclusions. Although there are plenty of similarities between the two films, Nanny McPhee Returns stands on its own as a magical family adventure. Set during World War II, the film brings Nanny McPhee (Emma Thompson reprising the role), warts and all, to a farm that’s run by a mother (Maggie Gyllenhaal of Crazy Heart) of three rough and tumble children (Oscar Steer, Asa Butterfield of The Wolfman and Lil Woods). Their two young cousins (Eros Vlahos and Rosie Taylor-Ritson) are sent to stay with them from the city, and they don’t think much of the dirty world of the country. 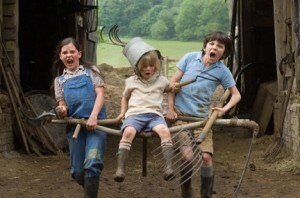 When Nanny McPhee knocks on the door, she helps whip the kids in shape, with the help of a few adorable dancing piglets. But this time the stakes are higher: The three children’s father (The Ghost Writer‘s Ewan McGregor in a cameo) is away fighting in the war, and their uncle (Rhys Ifans, Pirate Radio) is trying to convince their mother to sell the family farm so he can pay off gambling debts. The performances are all fine, especially Gyllenhaal, who pulls off a good British accent, and Sinead Matthews and Katy Brand as the hilarious loan sharks Miss Topsey and Miss Turvey. They make nasty so nice! The brilliant Maggie Smith (Harry Potter movies) also is in the cast as the dotty old Mrs. Docherty, who reveals a lovely surprise at the end of the film. And Ralph Fiennes (Red Dragon) makes an appearance as the cousin’s stiff father. The movie has plenty of silly moments that young children will especially love, but there’s also lots of heart for all the family. Like the original film, Nanny McPhee Returns was written by Thompson, based on the characters in the book by Christianna Brand . And Thompson wrote a book version of the new film . The Blu-ray includes a heap of deleted scenes, including a fun one that shows how Miss Topsey and Miss Turvey get thrown around. There’s also a number of featurettes that go into the making of the movie, but they’re all really quick. One of the best is the time-lapse look at Thompson getting made up to look like the magical Nanny. But kids also will love the piece on the piglets and jackdaws used in the film. The special features are fine, but pretty standard. The film itself is worth the purchase price.